Idealism and impressionability are the qualities they share, but Mahatma Gandhi’s thumb shows formidable willpower, and a stubbornness to the point of unreasonableness, as well as strong mental resistance. Whether this was a great quality or not is not the question here. What this stubbornness did for Gandhi was that it helped him balance the impressionability and made him impervious to influence. He would stick to his guns no matter what. On the other hand, Anna Hazare’s Moon mount is too strong and shows him to be a bit diffident and also something of a dreamer, with an inner timidity. Gandhi too was a dreamer (though to a lesser extent) and was a little timid as well (both have head and lifeliness joined and average Jupiter fingers) but Gandhi was less timid than Hazare is. Hazare’s humble persona is something he shares with Gandhi but Mahatma Gandhi was more humble (but less timid); humble to the point of lacking sufficient self-esteem. But Gandhi’s other qualities, like the stubborn will and strong mental resistance helped override his weakness. 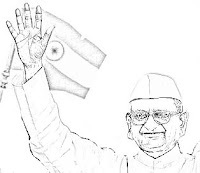 Both Hazare and Gandhi's hands show the kind of aggression required to push through their agenda and both possess will power and leadership qualities (Lower Mars, Thumb). 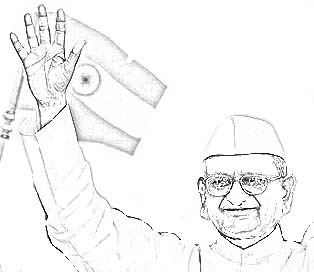 Anna Hazare‘s thumb phalanges are more balanced. This may seem like a strength because has the willingness to listen, and accept others’ point of view. A great quality by itself, but when combined with idealism, impressionability, and lack of mental resistance it can make a person weak. It makes him falter in the face of obstacles and it makes him vulnerable to the influence of others. In such a case the person would require the ability to stand his ground and also to evaluate people well. But Hazare has less of these qualities (weaker Mercury) as compared to Gandhi. He has also far less shrewdness and cunning than Gandhi had. Anna Hazare is more of a doer than Gandhi ever was. Mahatma Gandhi was more of an intellectual. (Fingers, phalanges, Headline). Both are very capable and effective leaders of men, as seen by their Headlines and Thumb, but their ways are different. Hazare is more likely to actually do things, act quickly and achieve much. But to the credit of Gandhi, he had a broader perspective which enable him to see issues as a whole and a better ability to judge their impact. Hazare would be dependent on others to show him the way. Hazare's integrity and honesty (like Mahatma Gandhi’s) is high, but he can be used by others. His straightforwardness, ability to listen, humility and simplicity, timidity, idealism, lack of cunning and lack of resistance are his vulnerabilities. This may make him a fine man, as long as he is surrounded by good and sincere people. Related Reading: Read about eminent personalities in India's history like Jawaharlal Nehru and Dr Sarvepalli Radhakrishnan or find out about what Mahatma Gandhi's hand says. For read about other Indian Politicians and also international names by checking out all readings filed under the label "Politicians." One of the most insightful hand readings on this blog. Amazing how you peeled off the various layers of Hazare's personality! Brilliant analysis. Though one could come to similar conclusions by looking at the events, this post is an excellent reference for comparing two great persons. Your balanced analysis of positive and negative qualities makes it a good read. Thanks. And if the events collaborate the marks on the palm, I guess that is a thumbs up for palmistry. 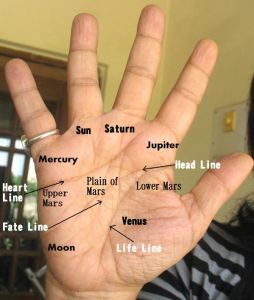 Palmistry is I think better than any personality test because one cannot hide the marks on the hand while one can fake tests and also fool people! I have been following the political events closely but could not have reached this conclusion. It was only after reading this post that I started to have doubts about people like Kiran Bedi (whom I respect) who are advising him. I also thought of Gandhi as a doer, but now after reading this and comparing him with Hazare I think you are right, Gandhi was more of a spiritual leader rather than a doer (despite the Salt March). What worries me in this analysis is that you say that Hazare's palm shows that he does not have strong mental resistance. I thought he had, from the events. But now I think maybe not...I don't know. TN, you have to keep in mind that this is a comparison. Everything is as compared to one another. For example Hazare is not cunning as compared to Gandhi, but it does not mean he is a fool. we are not fighters...after serious observation I feel we dont know how to live a good life. No, he is certainly not that ideal, he is weak in my opinion. 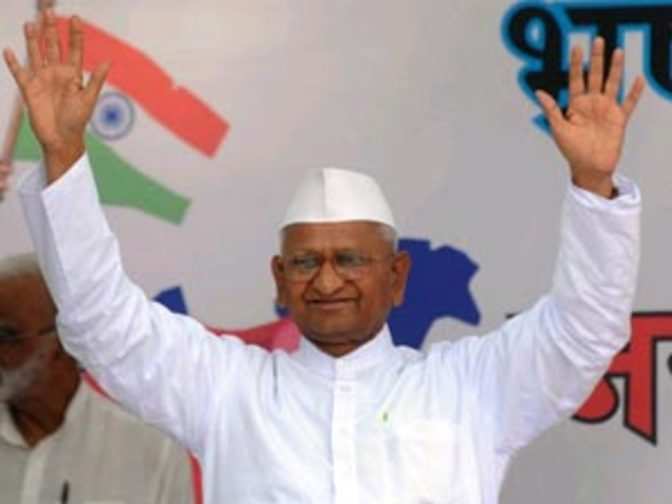 Gandhi never wanted to be part of any commission or party, but Anna Hazare does. I am not saying he shouldn't, but just that he is nothing like Gandhi. Thanks Draupad. About the flogging etc for drunkards, well he has always been doing it, much before the anti-corruption campaign. That is how he cleaned up certain villages of drunkards. Hazare is not a thinker (although he is an idealist) and therefore he can never be at heart a non-violent person. Only intellectuals and thinkers can be non-violent. However I think its best not to hate Hazare for not being Gandhian. He is at least better than our politicians who have no ideals or noble purpose. And I have already read Ramdev's palms, much before he was exposed for being what he is! Nita, how are you able to keep apart what you already know about public figures (from the media and your own judgement) from your palm reading. Does it not subconsciously affect your reading? I mean don't you think that it makes you look for confirmations of what you already know or believe about the person? Sonu, It is quite impossible to keep that apart unless I stop reading and absorbing the world around me. However, my method of working is different. I do invariably look for signs confirming a known personality trait of a famous person. If the signs are not present, either I say so (if it is a well known trait) or I do not mention it at all. Ofcourse I look for confirmation. I do not see anything wrong in that. There are various well known traits which I have said do not exist and that is also interesting because you can find out if the celeb is a fake. But then all of the reading is not about this. More often than not, I also see things which are not known.